A unique aerosol foam which enables simple and easy cleanup of tools, parts, workbenches, vent covers, machinery, coils, industrial equipment, concrete and more! 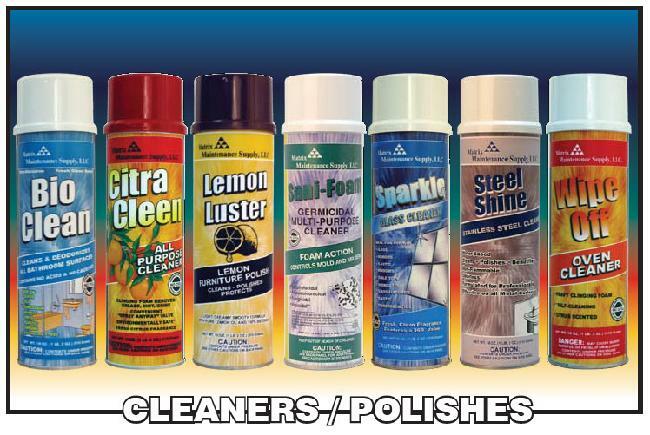 Sprays as an engulfing, heavy duty foam that clings to surfaces and provides extended cleaning contact time. Contains super powerful, water soluble, grease dissolving agents and detergents for instant "mega-forceful" cleaning action. Provides a self-indicating foam which quickly breaks down grease and grime and becomes dirty, indicating soil is ready to be flushed away. A portable, non-acid, foam cleaner that blasts deep into air conditioner, heater, refrigeration and dryer coils to loosen and remove grease, dirt, lint, and grime. Contains bio-enzymes for continuous cleaning and breakdown of organic coil contaminants. Helps maintain clean drip pans and drain lines. Non-Rinsing. Helps provide optimum unit efficiency. Deodorizes as it cleans. 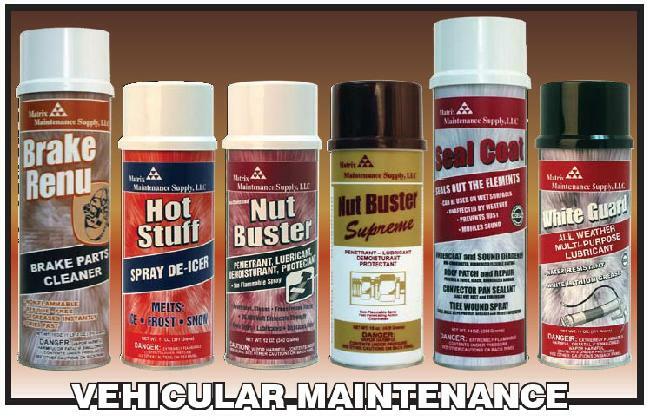 A flush action aerosol biodegradable solvent that quickly cuts through grease, oil, tar and many other soils. Treated surfaces can be wiped clean or flushed off with water. Eliminates harsh solvent vapors. Controls odors as it dissolves grease and grime. A high purity solvent that removes oil, grease, flux and other contaminants from electrical parts, relays, switches, contacts, motors, controls and more. Dries quickly, residue free. Safe for use on plastics. Flammable solvents require the material to be used on equipment that does not have electric current flowing. Includes extension tubes. A high power, non-flammable, non-conductive solvent that dissolves grease, oil, tar and other soils. Safe to use on electrical equipment even while in operation. Dries fast, residue free. Non-conductive and non-ozone depleting. No flash point. Features a powerful flush action valve. An all purpose, non-flammable, mechanics spray. Penetrates through rust and corrosion to loosen frozen nuts and bolts. Displaces moisture in wet electrical systems. Leaves treated surfaces protected with residual anti-corrosive film. Does not contain any chlorinated solvents. Safe around most plastic and paint. Features a non-flammable spray. A fast acting PENETRANT that quickly cuts through dirt, rust and scale to creep into parts which have become frozen by or encrusted with corrosion and oxidation. Provides a long lasting LUBRICANT which loosens dirt, rust and other corrosive elements, reduces friction and will not become dry, brittle or hard. Helps dry out wet electrical gear and other water sensitive parts. Prevents surface deterioration by acting as a DEMOISTURANT, which, with its unique molecular film, seals out water on all treated surfaces. Preserves equipment life and efficiency, thus reducing repair and maintenance costs. Can be used on either wet or dry surfaces. A true multi-purpose spray PROTECTANT that provides a shield-like film against the harmful effects of moisture and corrosion. Seal Coat is a portable, easy to use, thick black aerosol mastic coating that seals water leaks and fills cracks and voids on most roofing surfaces. Seal Coat is an extremely durable sealer and coating that will not sag or drip in summer heat or crack or peel in winter cold. 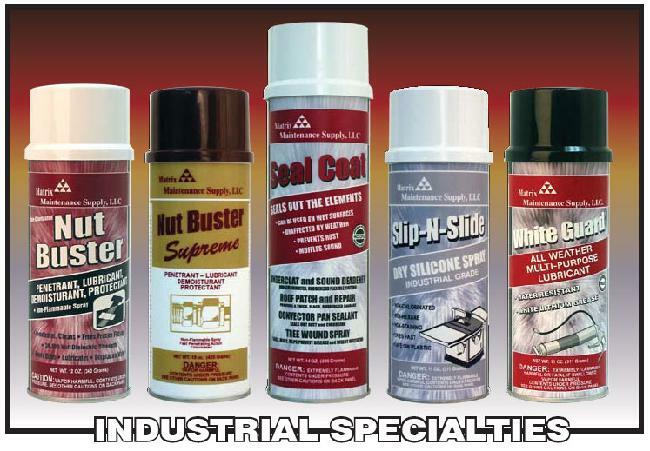 Seal Coat sprays as a liquid, flows into low spots, cracks and crevices then dries to a thick, black rubberized coating. Great for asphalt and fiberglass shingles, built-up tar and gravel, 1 ply rubberized and granulated roofs, mobile home and RV roofs, flashings around chimneys, vents and skylights. Helps seal concrete foundations and basements from water seepage and hydrostatic pressure. Provides an effective repair even when the surface is wet. Easy to carry, easy to apply. Eliminates mess, clean-up and burdensome pails. The highest USDA authorized, high viscosity, ultra pure, lubricant for use on food processing and packaging equipment. Leaves a waterproof, dry, non-staining, clear film. Heat stable from -40 to 450�F. Contains no chlorinated solvents. 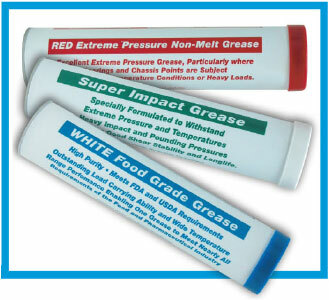 An all weather, heavy duty, multi-purpose penetrating grease. Sprays as a liquid, creeps to lubrication point like an oil, then cures to a thick, water resistant grease. 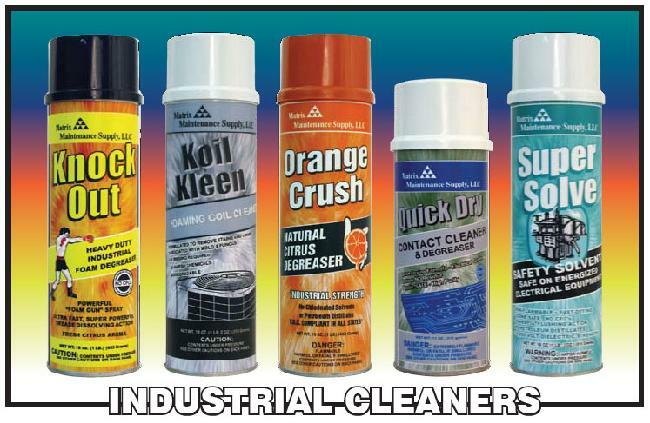 Provides non-staining lubrication that guards surfaces against rust and corrosion. Heat stable to 350�F. Excellent for many industrial and automotive uses. Includes extension tubes. 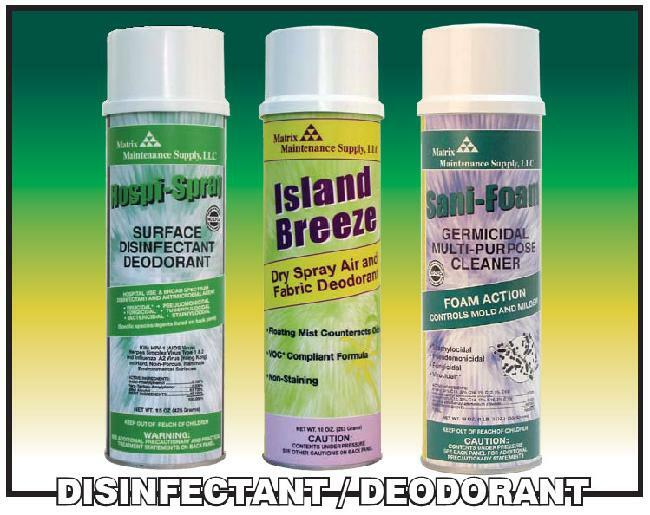 A phenolic disinfectant deodorant that destroys odor causing bacteria on environmental surfaces. Effectively kills Human Immunodeficiency Virus Type 1 (HIV-1; a retro virus that causes "AIDS" [Acquired Immune Deficiency Syndrome]), Staph, Pseudomonus, Tuberculosis, Fungus and many other virus strains (Influenza A2 virus and Herpes Simplex type 1 and 2). Eliminates odors in the air leaving a clean sanitary fragrance. Freshens the air and neutralizes smoke and other malodor. 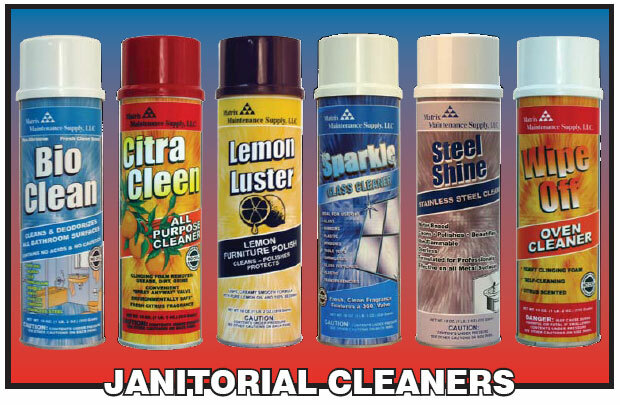 Sprays in a fine particle size that disperses fragrance throughout a large area without causing messy, wet fallout. Non-staining formula safe to use on fabric and upholstery. Spray-Thru cap works with can held in an upright or inverted position. A quaternary ammonia based foam that disinfects and deodorizes as it cleans. Cleans away and controls mold, fungus and mildew growth. Kills Staph, Salmonella, Pseudomonus and Herpes Simplex Virus types 1 and 2. Lemon Scented. 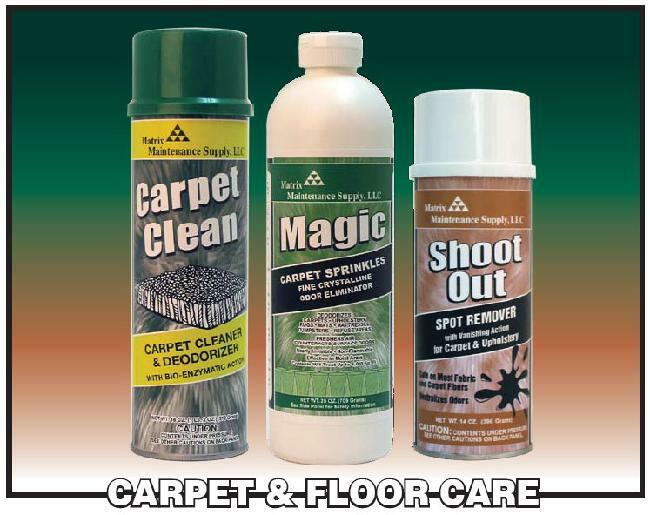 A hard working foam which deep cleans and dissolves embedded grime and organic matter ground into carpets. Bio-enzymatic action breaks down organic soils and strains and neutralizes odors. Excellent for fabric and upholstery in high traffic areas as it reduces out of service time. Leaves the treated area with a clean, fresh aroma. Inverted spray valve provides easy waist high application. A quick and easy means of eliminating malodor wherever they occur. Features a unique package which shakes out fine, nearly invisible, crystalline particles that absorb unpleasant odors and release a clean fresh fragrance into the area. Eliminates offensive odors caused by smoke, fire, mildew, garbage, moisture, diapers, cooking, animals and more. Effective even in moist areas. Non- Flammable Crystals enable use in ash trays and urns. One container treats up to 5,000 square feet. Deodorizes carpet, upholstery, mattresses, dumpsters, refuse areas and much more. A unique inverted spray solvent that removes water and oil-based spots and stains from carpet and upholstery. Eliminates the need for rubbing and scrubbing. Leaves no visible residue. Will not harm carpet backing or upholstery foam. Neutralizes odors caused by stains. Excellent pre-spotter prior to carpet extraction. Inverted spray value provides easy waist high application. A non-flammable, high solvency brake parts cleaner which safely removes contaminants which cause brake wear, annoying squeals and chatter. For use on all types of brake assemblies. Quickly removes Brake Fluid, Grease, Oil, Road Grime and other damaging contamination without the need to disassemble the brake unit. Application of this quick drying, residue free cleaner will extend the life of brake components and improve brake performance. A high pressure spray that quickly dissolves ice, frost and snow from windows and windshields. Thaws frozen locks. Helps prevent freezing when used in advance. Eliminates scraping and possible damage to glass. An all purpose, non-flammable, non-conductive mechanics spray. Penetrates through rust and corrosion to loosen frozen nuts and bolts. Displaces moisture in wet electrical systems. Leaves treated surfaces protected with residual anti-corrosive film. Does not contain any chlorinated solvents. Safe around most plastic and paint. Features a non-flammable spray. Provides a super thick, black, durable, flexible, rubberized film which seals and acoustically reduces unwanted vibration and sound. Protects metal parts against the harmful effects of water, salt, sand and road chemicals. Stays pliable in winter cold, yet won�t sag, melt or drip in summer heat. Resists cracking, peeling and abrasion. Muffles sound and prevents rust. One product which cleans and deodorizes all bathroom surfaces and eliminates conflicting odors caused by using multiple products. Unique bio-enzymatic action provides continuous cleaning of plumbing after rinsing down pipes and drain lines. A powerful, heavy duty foam cleaner that clings to and cleans any water safe hard surface. Contains special grease cutting additives and detergents for instant cleaning and grime dissolving action. Enhanced with citrus oil to deodorize as it cleans. A creamy, cleaner and polish formulated with silicones, beeswax and lemon oil. Adds life to dried out surfaces and covers minute scratches. Nourishes and moisturizes fine wood furniture. Imparts a durable gloss to all finishes as you dust. Pleasant lemon scent. A light foam cleaner that quickly cuts through and removes dirt, grime, grease, insect matter and more from glass and Plexiglas. Wipes out quickly leaving no streaks or haze. Makes cleaning fast, safe and easy. An economical and environmental solution to metal polishing. Formulated as a light cream consisting totally of food grade ingredients. Removes tough oil-based stains, water marks and spots and stains from all metal surfaces. Odorless cream clings to vertical surfaces and is safe for use in confined areas. Perfect for stainless steel surfaces which may contact water. Leaves no greasy film. A heavy foam cleaner that clings to oven surfaces and allows extended time to cut through baked on food, grease and carbon. Cleans most soils without scrubbing. Citrus fortified to improve cleaning power and mask necessary caustic additives. Product descriptions are in order from top to bottom. Excellent extreme pressure grease, particularly where bearings and chassis points are subject to moisture or high temperature conditions or heavy loads. Excellent shear stability. High temperature protection up to 500 deg. F. Excellent load carrying capacity. 65 Timken load. Extreme pressure protection. Resistant to oxidation, acids, water, salt spray, weather, dirt, dust and steam. Contains special corrosion and rust inhibitors. Excellent adhesive and cohesive properties. Exceptional anti-wear properties, even at high temperatures. Specially formulated to withstand extreme pressure and temperatures. Heavy impact and pounding pressures. Maintains good shear stability and long life. Will not throw off, sling off or squeeze out. High temperature protection up to 500 deg. F. Lubricates under boundary conditions. Waterproof and wash-out resistant. Provides extra cushioning to reduce shock and noise. 65 Timken load. Reistand to oxidation, acids, water and salt spray. High purity. Meets FDA and USDA requirements. Outstanding load carrying ability and wide temperature range performance enabling one grease to meet nearly all requirements of the food and pharmaceutical industries. Excellent water and steam resistance. Rust and oxidation inhibited. High load carrying ability. 40 Timken load. Resistant to food acid attack. Outstanding temperature stability to withstand both high and low temperatures common to the food processing industry (0 deg. F to 450 deg. F). Excellent adhesion. Resists throw off. Complies with FDA regulations CFR Title 21, Par 178.3570.